Hello, my name is Alan Kilduff, and I live in Rossendale, Lancashire. When I first started hill walking back in 2003 or so I kept to my local area, going up Pendle Hill, the Forest of Bowland or the West Pennine Moors. I was really nervous about getting myself lost and pretty unfit so long walks with a lot of ascent was out of the question. Then in September 2004 I did my first walk in the Lake District. I'd bought a Jarrold Pathfinder guide of Lake District walks (I hadn’t even heard of Wainwright) and picked a walk up the Old Man of Coniston. It was a beautiful day and I was hooked. I spent the next few years doing a lot of the popular walks in the Lakes and it was only later that I discovered that I’d managed to tick off about 180 Wainwrights or so. I then tried to tick off at least a few each year and in 2012 I completed on Castle Crag. I've decided to go and try and complete a second round, unfortunately the counter was reset when I completed my first round, so all the ascents of Fairfield and High Street up until then don't count. There's no timescale I'm working to, I'll bag them when I can and it will give me the opportunity to get back to some parts of the Lakes that I might not otherwise visit again. At the end of May 2017 I'm at 111. But in 2009 I thought, there’s a lot more to see with the Yorkshire Dales and Peak District close at hand. I’ve found that I really enjoy walking in both those areas as well. I’m much more confident in map reading now so going somewhere new holds no fears. I guess it means I’ve got plenty of places to choose from and there are times when the Lakes are very busy, I can’t face the journey up the M6 or time is limited. The length of the route and the total ascent I have taken from my Memory Map software and are accurate as far as I can tell. I have also included the length of time it took me to do the walk. This is of course how long it took me to do the walk and the time taken very much depends on how often stops are taken, the conditions underfoot and the weather at the time. For each walk I have provided a map with the route that I followed marked on it. I have also included the number of the OS Explorer map that I took with me on the walk. Until I started hill-walking I had no interest in photography whatsoever. It was soon after that first walk in the Lake District back in 2004 that I bought my first camera. The views I'd seen that day made me want to capture the experience of the day that I'd had. I've changed cameras a few times since then but I always have it with me when I go out walking and I have photos of pretty much every walk I've done. 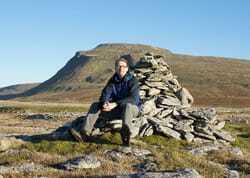 Back in March 2011 I joined the Online Fellwalking Club. The club has a message board where the members can share photos of the walks that they've done. Up until then I tended to take a photo whenever I saw a view worth taking a picture of but sharing my albums with the rest of the club made me think about taking pictures to help illustrate the route I was taking. I suppose creating this website was the next logical step. Anyone visiting this website is welcome to copy and use any of the photographs for non-commercial use with the request that Alan Kilduff is credited as the photographer. If they are to appear on another website please include a link to my website Pennine Walker. I guess these days I have to give this message. Those of you visiting this site who are hill-walkers know the risks that we take when we go onto the hills. I would urge anyone planning on going walking in the hills to do so with a map and compass and most importantly know how to use them and to go appropriately clothed and in the right footwear. The timings I've given for the walks are from the day I did the walk on. These timings are no guarantee that anyone choosing to follow a similar route would complete it in a similar length of time. The information provided is, to the best of my knowledge, accurate. However, I do not accept any liability for any loss, damage or injury incurred by those using any information contained within this website.